An exciting trip! Originally, I had wanted to climb with David Kennedy in Yosemite. 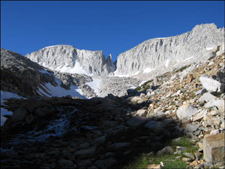 We had planned to do either the Cathedral Range or North Peak and Conness. Unfortunately, David had been sick all week and did not feel fit enough to go on such an outing. Therefore, I was on my own, at least for Saturday. Saturday evening I was supposed to meet Jeannine and Angela and Tuolumne Meadows. I left Davis at 2am, after having slept 3 hours from 9-12 and after having spent two hours at Daniela's housewarming party at the Italian house. I drove straight through and, while driving through Bishop, decided to hike again in the Little Lakes Valley, where I arrived at 7:15. I began hiking shortly thereafter and headed up to Ruby Lakes and left the Mono Pass trail to continue South towards Mills Lake and the Abbot Glacier located only a short distance beyond the lake. I only encountered a few people camping and one photographers taking pictures of Ruby Lake and Ruby Peak slowly getting illuminated by the rising sun. I was not sure if I wanted to do Mills or Abbot, but upon arriving at the glacier, I just happened to be closer to Mount Mills and decided to tackle that one. I easily found what I thought was the East Couloir, which was still filled with snow. After strapping on the crampons I headed up the left side of the couloir but soon had to traverse the steep snow over to the right where the class 3 scrambling in the small gap between snow and lose rock locked much more comfortable. Trip reports talk about a chockstone blocking this gully at some point, but I never encountered such an obstacle and soon arrived at the ridge leading to the summit plateau, which is fairly small. 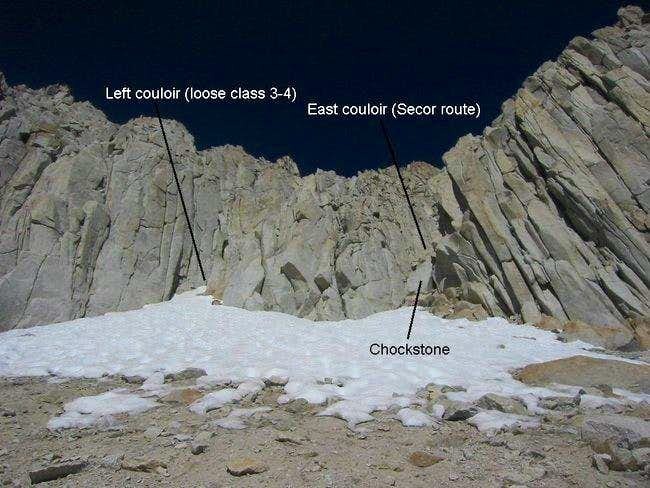 After returning back to Davis, I consulted with SummitPost, where I found this picture, and I now believe that I ascended the left couloir and then descended the right couloir, where the chockstone was easily passed with a couple of class 4 moves down the left side of it. It had taken me three hours to the summit and the views were spectacular, especially of neighboring Abbot, Morgan (the highest peak in the Little Lakes Valley) and the Convict Lake area. I bathed in the sun for half an hour, rummaged through the registry (found an entry by Secor), which had been place in 1981. Apparently, this mountains sees on average less than one visitor per month. I assume more people aim at Mount Abbot, because it being an Emblem Peak make it somewhat more prestigious. And that's where I was headed next. Back at the glacier I put on crampons and headed up the snow towards Abbot. I tried to stay on the snow as long as possible, expecting to find similary lose talus and sand on Abbot then what I had encountered on Mills. However, when I left the snow (and my crampons behind) I thoroughly enjoined the short sections of Class3, because it was fairly solid boulder-hoping up to the summit ridge. I saw the airy bridge and found it much easier than it looked from further away. It is maybe 3-4 feet wide and can easily be crossed without looking too much down the dropoffs on either side. After the bridge, a short Class 3 section leads to the top. I arrived at the summit at 1:30, about 6 hours after I set out in the morning. A nice summit registry placed by the Sierra Club contained a nice leather note book, which had been placed there 17 years earlier. After signing it I took a couple of self portraits and enjoyed the scenario. I could now see Bear Creek Spire, which had been blocked by Abbot from the summit of Mills. Beautiful views. I descended the same way I came up and headed back to Mosquito Flats after stopping only once for water. Driving back up north, I met my friends at the Tuloume Meadows Store at 7pm. I had been there at 6:05, five minutes after the first rendezvous, but they had just left. So, I drove around a bit, checking for campgrounds and even asking at the Cabins ($96 for three, a bit steep), but luckily Jeannine and Angela had found a camping spot at T. Meadows and were already set up when I met them. After eating delicious pasta and sitting around the campfire (where I pathetically managed to finish one can of Miller), I retired early and slept soundly despite the freezing temperatures of 26 Fahrenheit measure that night at T. Meadows.